What's better than getting the iPhone 6 on the release date? Getting it at a significant discount by recycling your old phone for maximum trade-in value, obviously. Here's the problem: As millions of people eagerly anticipate the iPhone 6 announcement on September 9th, the trade-in value of current phones drop precipitously. But you can't trade in your current phone without a new one to replace it. And when the iPhone 6 is available, your current phone will hold significantly less value. So how can consumers come out ahead? 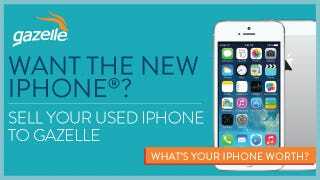 With help from Gazelle, a site dedicated to trade-in consumer electronics, you're given the opportunity to lock in the value that your phone holds prior to the September 9th announcement. Then, the trade-in doesn't need to take place until October 10, once the iPhone 6 is on the market. So when you trade-in your old phone for the iPhone 6, it will hold same the value it did today, as if new technology never hit the market. Lock in your phone's trade-in value today (pricing will fluctuate between now and September 9th). Here's a look at some pricing as of August 29 (based on 16gb devices). This is found money, people, which can be put towards you new iPhone. Simply go to Gazelle and tell them what your current phone is and its current condition. Gazelle will quote you a value, and if you sign up, lock-in that price. They send you shipping materials, and once you purchase the new iPhone 6, you'll send your old device in and receive your check.